A house made out of old tires is economical, both in its building and in the energy efficiency of the home. Additionally, covered in adobe, a tire house can be just as attractive as any house. Nobody knows what the walls are made of when it's finished. Design your tire house and prepare your site. Consult an architect and contractor, or a layperson who's built her own home, if you don't have experience in home design and site preparation. Touch the Earth Construction specializes in tire homes, providing plans, assistance and answers to frequently asked questions. 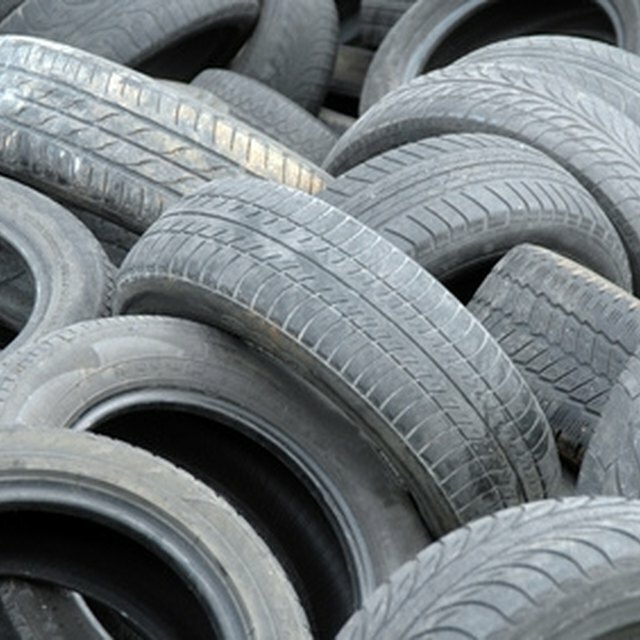 Acquire a large number of used, standard size passenger car tires. Aim for gathering at least 1000 from local junkyards, landfills and tire dealerships. If tire houses aren't popular in your area, you can get them for free. Lay the tires one-deep where you want your walls. Place cardboard in the bottom of each tire. Fill each tire with dirt, using a wheelbarrow to transport it and ramming the dirt down thoroughly. You can do this by hand with a heavy sledgehammer or you can rent earth-ramming equipment to do it more quickly and thoroughly. It takes approximately three wheelbarrows full of dirt to fill one tire. Stack a new layer of tires on top of the first, staggering them for stability, and repeat the filling and ramming process. Stack additional layers of tires the same way until your tire house walls are as high as you want them. Use aluminum cans for filler to create a relatively flush wall. Then, cover both the interior and exterior walls with concrete. Create the roof of your house. In a standard tire house construction, the roof can't be made of tires. Use whatever materials can achieve the design you envision. Apply adobe plaster to the tire walls to create a smooth finish with insulating properties for your tire house. You can also use other methods to create tire homes, but the most effective methods use stacked, earth-filled tires. In areas that don't often drop down below freezing, you may not need heat in your tire house. Consult contractors who specialize in electricity and plumbing to design and install these utilities in your tire house.